Competition is fierce; make sure you're prepared. To stay afloat in today's digital, online-centered business world, every company that depends on marketing to attract new customers must have a well-developed online presence in order to survive. That includes an informative website, fully optimized for search engine indexing, commonly referred to as onsite SEO, a clear and notable online presence through social media (offsite SEO), and possibly an Android or iOS mobile application to better interact with your customers. Our solutions to these issues have the Imperial Development Force boosting your organization's digital profile for you - so you can set your focus on delivering quality service to all of your new clients. 6,586,013,574 searches a day worldwide. Shouldn't you claim your share? Your customers are out there looking for you. With almost 7 billion searches performed daily, you are missing out on potential clients if your business isn't optimized. 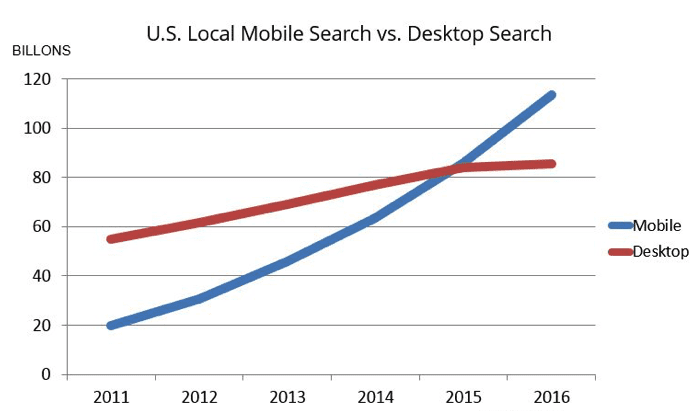 Not only should your website be optimized for search engines like Google, but also for mobile devices - which have finally taken over desktops as the preferred interface for internet searches. The numbers paint a pretty stark picture: get your online business profile established or be left behind. More amazing search engine statistics can be found here. Pick the development strategy that best suits your current operating needs. Not sure where to begin? We can help with that too. Your business can't attract new customers if they can't find you! Increase your ability to be noticed on all the major search engines by implementing our SEO program. Already have an on-site SEO implementation but need to boost your search engine visibility? We'll get your company noticed on all corners of the Interwebs. A good mobile app can allow your customers to interface with your business directly on a app targeted to their mobile device. If your company is just starting up or trying to bring itself into the new generation, then it needs to have an informative website for its customers. * - Search Engine Optimization with online Marketing combines the best of both business necessities. Your customers are out there looking for you. We bring them to you by expanding your online presence. * - Available for Android and iOS devices only. A user-friendly website is imperative for modern business operations. Don't have one yet? We'll fix that.